Carlos Correa received some high accolades on Monday. The Sporting News has named Houston Astros shortstop Carlos Correa its AL Rookie of the Year, as voted on by all 176 players in the American League. Correa, 21, is widely considered to be a strong candidate to be selected by the Baseball Writers Association of America’s Rookie of the Year when that decision is announced on November 16. Carlos Correa’s colleagues named him the AL Rookie of the Year. He takes the Sporting News award, which is voted on by AL players. 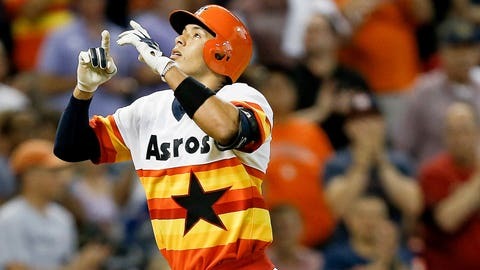 Correa joins Willy Taveras (2005), Bagwell (1991), Jeffrey Leonard (79), Greg Gross (74) & Joe Morgan (1965) as former Astros SN ROY. The #Astros also had @royoswalt44net, (2001), Al Osuna (1991) & Tom Griffin (1969) – win NL Sporting News Rookie Pitchers of the Year. Lance McCullers received a pair of votes of the 176 in the voting that gave Correa the Sporting News AL ROY. Correa had 98 votes, Lindor 30. Correa’s incredible rookie campaign in 2015 helped the Astros make the postseason, take down the New York Yankees in the Wild Card Game and push the Kansas City Royals to Game 5 of the ALDS. He hit .279/.345/.512 with 22 home runs, 68 RBI and posted a WAR of 4.1 while forming a dynamic duo with second baseman Jose Altuve this past season, more or less acting as an embodiment of the organization’s tremendous young talent pool. Now that Correa has taken home the Sporting News’ ROY award, all eyes look to the BBWAA – which will likely give its award to him or Cleveland Indians shortstop Francisco Lindor, who also made a fast impression in his first full season in MLB. #Astros Rookie phenom @TeamCJCorrea will transition to the media during the World Series. He heads to KC Tuesday to work for MLB.